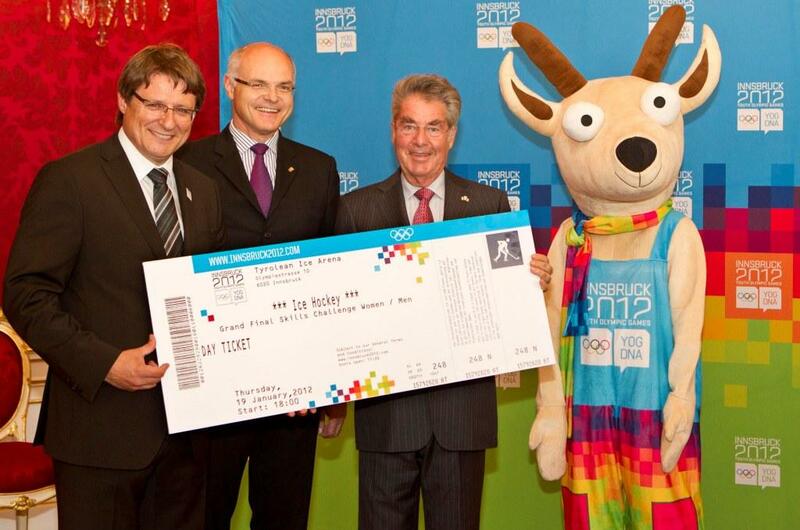 October 4 - Heinz Fischer (second from right), President of Austria, has been presented with the first official ticket for the inaugural Winter Youth Olympic Games, which take place from January 13 to 22, 2012 in Innsbruck. A delegation from the Austrian Olympic Committee (ÖOC) and Innsbruck 2012 presented Fischer with the ticket at Hofburg Palace, Vienna. "It is a great honour, but also a great responsibility, to organise the first Winter Youth Olympic Games," Fischer said. "For 10 days the eyes of the entire sporting world will be on Austria, just as they were on Singapore in 2010 during the first Summer Youth Olympic Games, which were attended by media representatives from 166 countries. "This historic moment is a fantastic opportunity for Austria to present itself to the world as a professional host and a leading nation for winter sports and tourism." More than1,000 young athletes will congregate in Innsbruck for the Games, the first of their kind, and the Innsbruck 2012 motto "be part of it" hopes to give as many people as possible the chance to be involved in the Olympic Movement. "Through the event, we want to encourage young people to have fun doing sport and to learn about the Olympic Idea," said Karl Stoss (second from left), President of the ÖOC. On another matter, Innsbruck 2012 chief executive Peter Bayer added, "sustainability is a big part of our Games, and for the first time ever the entire Youth Olympic Village has been constructed using passive house technology." To mark 99 days to the start of the Games, 999 tickets will be available to the public free of charge from October 6 at www.innsbruck2012.com.